Large earthquakes do not occur often enough in Utah to "remind" people that they are living and building in earthquake country. This scenario presents a unique challenge for the state geological survey. Groundwater follows a winding path  and one much faster than previously thought  to municipal wells in the city of Sturgeon Bay, and it may pick up contaminants along the way. One size (or strategy) does not fit all where Dakota groundwater management is concerned. David C. Gosselin et al. Expert speakers, a lasting guidebook, comfy chairs and detailed planning are key ingredients for helping New Mexico's decision-makers appreciate why science is important in the state. Visit Geotimes.org latest addition, a new searchable archive. Search for news stories by topic, date or title, and link to other Geotimes archives! Achieving energy independence will take significant federal investment in research. And were off! The fiscal year 2004 appropriations process is underway, with one bright spot and several large challenges ahead for geoscientists. Scientists question how the Spanish government handled the sinking of the oil tanker Prestige, which is still leaking. A merger between BP and one of Russias largest oil and gas companies signals that Western investment in Russian oil is on the rise. The Salt Lake City Skyline: Mountains loom over this growing region, as do the effects of the geologic forces that created them: such as landslides or the threat of an earthquake along the Wasatch fault, which runs through urban areas. 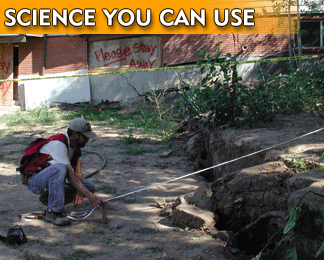 The state geological survey is working to help people build intelligently here. Read the story online. Photo supplied courtesy of the Salt Lake Convention and Visitors Bureau.